Honestly - do YOU remember your oldest stamp? The one you started papercrafting with? I don't - so I flicked through my older stamps and picked a set that I know was super old - it's the "Bird assortment" set by Inkadinkadoo. 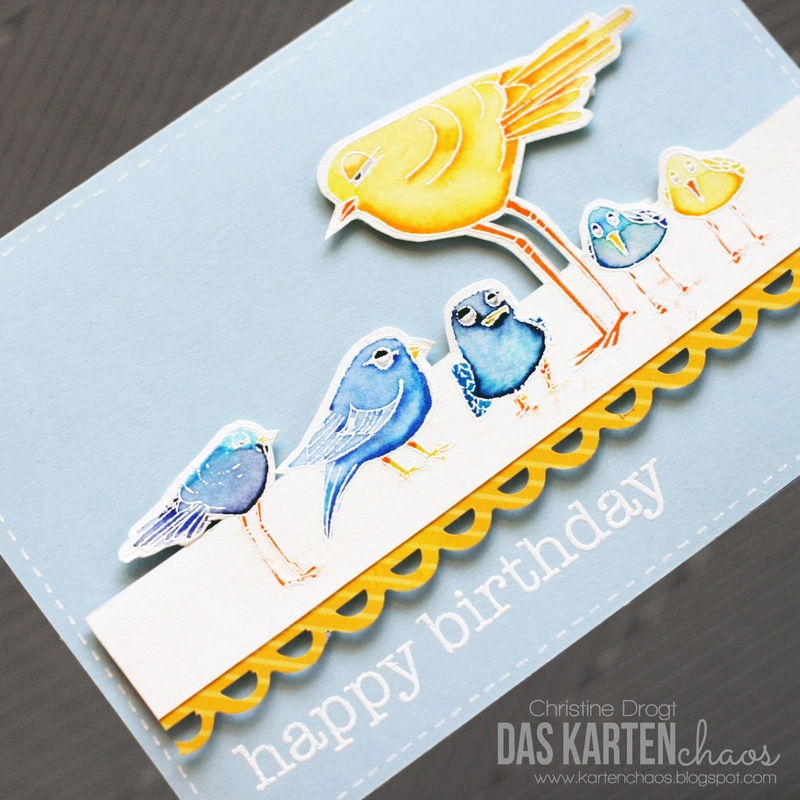 I stamped the birds in a row with Versamark ink, embossed in white and colored them with my Kuretake Zig Clean Color Real Brush Markers and some water, fuzzy cut the top portion and assambled the card. Then I White embossed the sentiment and it was done. I already told Anni, this feels like a 2012-card - even if I don't exactly know what that means - lol. I think Anni and I made a lot of cards in that style back then. Hope you still like that "oldschool card" - ha! Now it's time to hop over to Anni's blog to see what she created. Ha, ich finde die ist total genial geworden und es war dringend Zeit, dass die hübschen Vögel mal wieder ein wenig Liebe bekommen! Uuunnnd ich finde auch auf jeden Fall, dass die Karte sich auch 2015 wunderbar sehen lassen kann! Vielleicht ist es der Randstanzer, der das das nostalgische Gefühl bei dir entstehen lässt? OH, diese Voegel hab ich auch - so eine schoene Karte!!!!! Christine, what a perfect card. If this is a 2012 card I would be happy to be there. 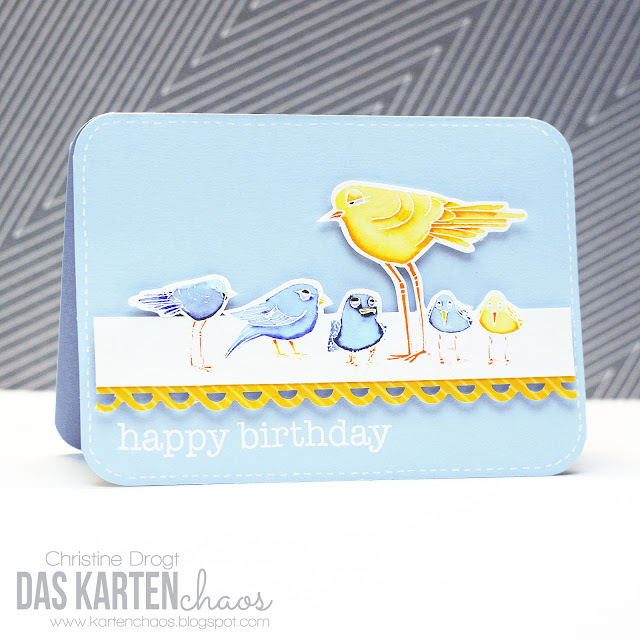 Love these birds and your layout and colours, just perfect. 2012... so wie du das sagst, klingt das ja fast wie tiefste Vergangenheit... Dabei ist das doch noch gar nicht so lange her! Oder? Unsere Hochzeits-Einladungen gemacht und mich am intensiv-Karten-Bastelvirus infiziert...! O.K. - ist doch schon ne Weile her :-) Eine tolle Zeit war's aber! Deine Karte jedenfalls ist zeitlos chic! Vor allem die Koloration von dem großen gelben Vogel ist klasse!